I have a very nice breakfast this morning in La Fontaine, the main dining room. I am seated at a table for four, and meet a couple from Chemainus who used to do the mapping for BC Parks interpretive signs, and a young woman from California who is debarking in Callao/Lima to realize her dream to see Machu Picchu. The couple relate how they traveled to Ft. Lauderdale by train using Amtrack from Seattle to Chicago, then to Washington, DC, and finally to Ft. Lauderdale. Apparently their arrangements cost about the same as flying, and it took 3-4 days. This strikes me as a great way to avoid the hassle of the airlines and airports if you have the time to spare. I attend a presentation by Martin, the Shore Excursions manager this morning, where he reviews all the excursions for the first half of the voyage. He mentions that all Holland America excursions to Machu Picchu depart the day after our scheduled arrival in Callao/Lima because the ship is often late arriving if the seas are rough off the South American coast. This is a concern of mine, since we leave on a flight from Lima airport around 2PM on the first day of arrival, so I hope the seas cooperate and the ship arrives on time. I’m resolved to not worry about it, since there is absolutely nothing I can do about weather in the Pacific or when our ship arrives in port some two weeks from now. At noon today I spot the eastern end of Cuba from the right side of the ship. The captain announces we are passing within 6 nautical miles from the tip of Cuba at 2PM. 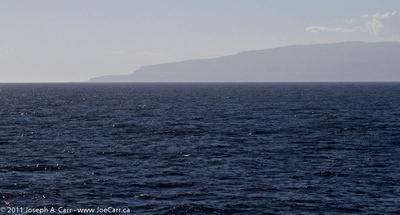 The island of Hispanola is visible from the other side of the ship, but it is really just a smudge on the western horizon as we sail between these two large islands. I take some photos of both, but because it is midday the results are washed out despite using a polarizing filter. It is formal night this evening and my friends and I go to Canaletto, the Italian-themed restaurant. The food is wonderful, and the serving staff is very friendly. After dinner on the Lido deck, I see the Green flash of the setting Sun from the poolside table in the Lido as the ship sails up the coast. 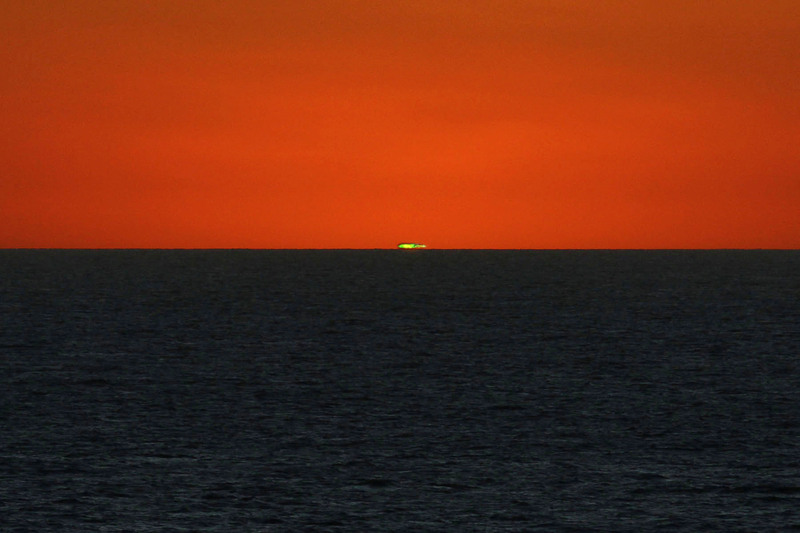 My friend takes some good photos of the green flash from the deck above, however I’m pleased to visually observe this apparition. This is a personal first for me after many years of trying! Afterwards, we we go to the deck above the bridge to observe the night sky. It is nice and dark up there – Jupiter is directly overhead, Orion is laying on his side in the East, the Pleiades (M45), Andromeda Galaxy (M31), the M35 open cluster, and the red star in Taurus are all easily observed with both my image-stabilized Canon binoculars and unaided eyes since it is so dark. I go to the late show at 10PM, which highlights Broadway song-and-dance. This is the first time I have seen the ship’s singers and dancers. The numbers they perform are really well done and it is fun to watch. I decide to go to La Fontaine, the main dining room again this morning for breakfast. I am seated at a table for six with a couple from Calgary and a couple from Houston, Texas. The woman from Houston is originally from South Africa and spots my JoeTourist Africa t-shirt I’m wearing, so she and I talk for quite awhile about South Africa. She was pleased to hear I drove from Johannesburg all the way down the Wild and Garden coasts to Cape Town. She related some interesting stories about the gold mines when she was living in South Africa many years ago. As many South Africans did, she decided to emigrate when she was a young adult because of the personal security issues plaguing the country. I attend another presentation by Martin, the Shore Excursions manager this morning, where he reviews all the excursions for the second half of the voyage from Ecuador up the Pacific Coast to Mexico. I might decide to book a tour in Guayaquil, but otherwise I think the shore excursions I have pre-booked will work fine for me. 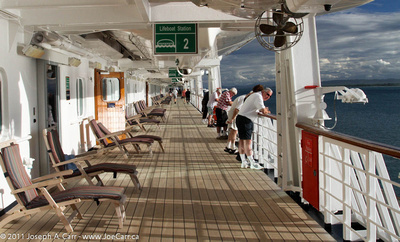 After lunch, I sit out on the Lower Promenade Deck in a deck chair and read The Black Echo – a book on my iPad. It has taken me awhile to get into this book, but now I’m actively reading it. This is classic cruise ship stuff – reading a book in a deck chair, and I’m not alone. There are dozens of passengers doing exactly the same thing. It is American Thanksgiving today, so roasted turkey is on the menu in La Fontaine the main dining room this evening, however I have the grilled salmon instead. I also order a bottle of California white wine, since my friends and I feel like some wine with dinner this evening. Most times we don’t bother drinking with our meals since it is pretty expensive. We have some nice desserts and cappuccino to finish. We manage to find some of the last seats available in the first show in main showroom to see Lance Ringnald, a two-time Olympic gymnast gold medal winner who does a great acrobatic show using silks hanging from the stage ceiling. I saw his act on the Volendam on last year’s cruise, and was eager to see a repeat performance. He didn’t disappoint. This is not typical of the featured entertainment you expect to find on a cruise ship, but Lance has perfected a nice combination of gymnastics, acrobatics, and funny banter with the audience that works well and is entertaining. I go to bed after the show, since we are in port tomorrow in Santa Marta, Columbia, and I have a half-day shore excursion to catch at 8:35AM. 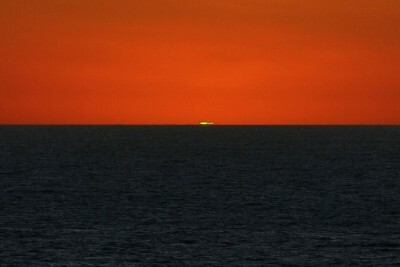 This entry was posted in Caribbean and tagged astronomy, cruise, cruise ship, gymnast, sunset. Bookmark the permalink.